There are several ways. I'm going to share them ALL because I know there is no way each one is always going to be accurate and up-to-date! I try to remember to tag posts that offer a free printable with "free printable." You'll find tags at the end of every post or post except (like on the home page). This is the best way to find them ~ if you want to look at all of them . . . and if I always remember to add the tag. 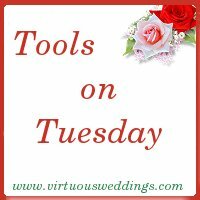 Many Tools on Tuesday posts are free printables. You'll find the tag at the bottom of any Tools on Tuesday post or post excerpt. Search for "free printable" (use quotation marks). You'll probably get more results than you want. You can use other terms to narrow your search. Looking for free printables for the bride? Looking under the For the Bride post category. Looking for wedding printables? Look under the wedding category or a wedding sub-category. Note that the menu items at the top (with dropdowns) are not the post categories. Those are the pages. You can always find the post categories on the home page. Or, click on one of the menu items to go to that particular section (e.g. Wedding or Setting Up Housekeeping). Post categories in that section will appear on the right. Pages (the things you get to from the main menu above) will often contain links to relevant free printables. Got something to share? Link it up!